Simply Abu Dhabi, is Officially the World’s largest ‘privately owned’ Multi-Media Channel for Abu Dhabi. We communicate to 7,800 of the World’s Wealthiest through our Print Medium and talk to over 700,000+ High Net Worth & Aspirational individuals daily via our digital channels. Our traditional Publishing division element, offers a truly unique opportunity as a specialist publisher that has been established for 7 years and produces a By Invitation Only luxury lifestyle coffee table book four times per annum, which plays a pivotal role in the promotion of Abu Dhabi, Dubai, and the UAE. Our Digital communication channels include an organically grown Facebook account, which boasts an audience of 504,000+ fans, complimented by three instagram accounts @simplyabuhdabi (120k), @amazingabudhabi (54+k) and @simplydubai (70+k) and our Co-Founder personally has over 19,000 connections/key decision makers on Linkedin (https://uk.linkedin.com/in/arnieshira) allowing us to communicate to over 700,000+ unique individuals on a daily basis. Simply Abu Dhabi’s multi-media communication reach via print and our digital landscape boasts such a broad demographic spectrum that our ability to demonstrate a valuable return on investment and proven engagement for any brand is more apparent than ever. This pattern of proven success is demonstrated by the consistent reinvestment from various recognised brands who chose to advertise with us and include the likes of some power house names such as; Richard Mille, Rolls Royce, Abu Dhabi Commercial Bank, Gulfstream, Chanel, Dolce & Gabbana, Harry Winston, Giampiero Bodino, Emirates Palace, Burj Al Arab, Boodles, David Morris, Velaa Private Island, The Royal Mansour, Omega and Fendi, to name a very select few from our partner portfolio. 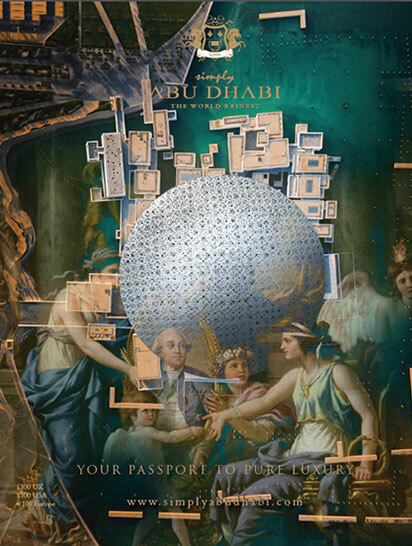 While many traditional publications have moved exclusively across to digital, luxury lifestyle publishers such as Simply Abu Dhabi continue to deliver the best of both worlds and still provide an inimitable sensory experience to our readers, which has allowed our printed publication to evolve into a luxurious collectible within its own right. The UAE, GCC, London, Paris, Milan, Monaco, Moscow, New York, Los Angeles, St. Tropez, Singapore, Shanghai, Hong Kong, Mumbai & Delhi. Tesla’s; Elon Musk, Facebook’s: Mark Zuckerberg, Google’s; Sundar Pichai & Amazon’s Jeff Bezos. Blackstone’s; Stephen A. Schwarzman, Richemont’s; Johann Rupert, LVMH’s; Bernard Arnault and Francois Pinault at Kering!